Amazon dramatically increased the stakes in its ongoing battle with Apple for digital media supremacy, officially launching its long-awaited, Android-powered tablet device as well as new Kindle e-reader devices. The Amazon tablet, dubbed the Kindle Fire and priced at $199 (compared to $499 for Apple's cheapest iPad), effectively gives consumers a single, portable point of access to digital media initiatives including the Kindle e-book catalog, Amazon Appstore for Android, Amazon Instant Video and Amazon MP3, with all content backed up in the cloud. 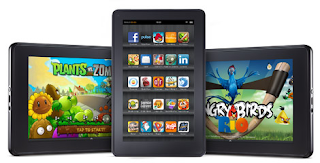 The Kindle Fire integrates with the Amazon Web Services platform and enables consumers to leverage free media offerings included within Amazon Prime, the $79 annual service that also offers unlimited two-day shipping on all products sold and processed by the e-commerce giant, excluding items offered by third-party sellers. Unlike Apple, which relies on content from its iTunes digital media storefront and App Store to boost sales of hardware like the iPhone and iPad, Amazon is looking to the Kindle Fire to stoke consumer interest in its premium digital media ambitions. "For 15 years we've been building our media business and it's become a $15 billion a year business," said Amazon founder and CEO Jeff Bezos during Wednesday's media event, stating that the company now offers more than 100 million feature films and television programs available to buy or rent. In addition, the Amazon MP3 storefront touts more than 17 million songs, some priced as low at 69 cents. Kindle Fire also heralds the launch of Amazon Silk, a new browser promising to accelerate the mobile web user experience by caching and compressing data and images. Living both on the tablet and Amazon's own EC2 servers, Silk promises to consume less bandwidth than other tablet browsers, translating to faster page and multimedia load times. The Kindle Fire does not feature 3G network access, instead relying exclusively on Wi-Fi connectivity. Apple eat your heart out... The $199 pricing is certainly a killer price and it will definitely eat into Apple's market dominance on the tablet segment. With the Amazon content bundled in, its definitely a great offering and more importantly affordable. Guess who are paying mobile games?